Although most people burn around 100 calories per mile of walking or running, that's only a generalized estimate. The true number of calories you burn depends on a variety of factors, including how much you weigh and how hard you're working or how fast your'e walking. Wearing a pedometer, which counts your steps, can increase your motivation to hit the trails, and Harvard Health Publications reports that people increase their overall physical activity by 27 percent after they began wearing a pedometer regularly. 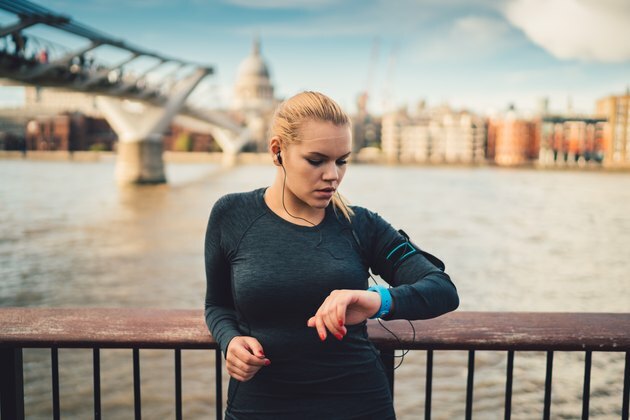 You can purchase a relatively inexpensive pedometer to gain the motivational benefits, but it may not have all the features of more expensive products. If your pedometer can't do it for you, you will need to know how to convert the number of steps your pedometer counts into actual calories burned. You can accomplish this conversion with a few simple calculations. Read more: How Accurate are Pedometers? To start, multiply your weight by 0.57 to calculate how many calories you burn in 1 mile of casual walking, which is around 2 mph or a 30-minute mile. For example, if you weigh 175 pounds, the calculation would look like this: 0.57 x 175 = 99.75 calories per mile. To get that number down to how many calories are burned in each step, walk casually for exactly 1 mile while wearing your pedometer. Record the number of steps it took you to walk that mile. For example, it may have taken you 2,200 steps. Divide the number of calories you burn per mile by the number of steps it takes you to walk a mile. The result is a unique-to-you conversion factor you can use to calculate how many calories you burn from the number of steps you take as you walk. Read more: How Many Steps Make a Mile on a Pedometer? When you increase the pace, you also increase the calorie burn. Multiply your weight by 0.5 to calculate how many calories you burn in 1 mile of brisk walking. This factor is based on a formula that calculates calories burned when a person walks at a rate of 3.5 mph. Again, walk briskly for exactly 1 mile while wearing your pedometer. Record the number of steps it took you to walk that mile. For example, it may take you only 1,400 steps because you usually take larger strides while walking briskly. Divide the number of calories you burn per mile by the number of steps it takes you to walk a mile to find the conversion factor you can use to calculate how many calories you burn from the number of steps you took each time you walk. Runner's World: Running v. Walking: How Many Calories Will You Burn?